New Melbourne Browncoats, Inc. | CSTS 2015 Merchandise is now available to pre-order! CSTS 2015 Merchandise is now available to pre-order! We’re excited to announce that pre-orders are now open for Can’t Stop the Serenity 2015 merchandise! 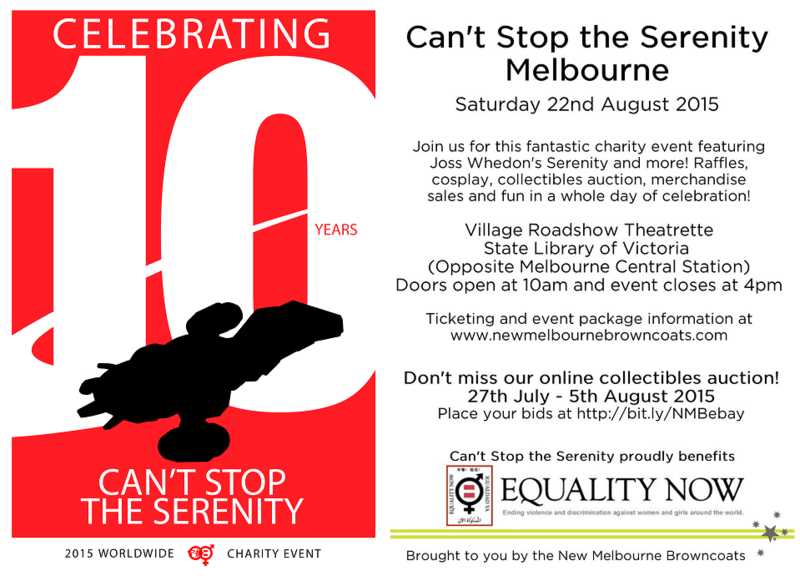 Grab yourself a souvenir celebrating 10 years of Can’t Stop the Serenity and kit yourself out in style. Proceeds from all CSTS merchandise sales benefit Equality Now. To pre-order yours, head over to our Online Store! Pre-orders close on Friday 17 July. Merchandise will be available for collection at Can’t Stop the Serenity on August 22. If you would like your merchandise posted out (approx. 2 weeks prior to the event), this will cost an additional $15 per package up to 1kg or $20 for over 1kg. If you have purchased an event package that includes a CSTS T-shirt, you will be contacted to request your size. And if you haven’t purchased your ticket to Can’t Stop the Serenity yet, what are you waiting for!